Sounds delicious, but what does it really mean? 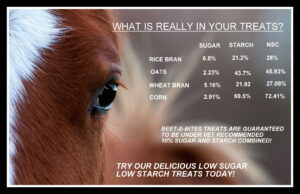 Carbohydrate sensitive horses (IR, Cushing’s, EMS, PSSM) horses need to be on “sugar-restricted” diets, and their diets must be closely monitored to avoid issues with laminitis, so labels just stating that they are low sugar, lower sugar, or sugar-free need to be scrutinized carefully. On our internet journey’s, we have come across many misrepresented treats that are being labeled as sugar-free, and low sugar, yet contain ingredients that are notoriously high in sugar and starch. Many of these treats are oat based, rice bran based, most of them contain molasses, and the new wave of” sugar free” treats that have agave as a sugar substitute. The Agave sweetener sold today is made by treating the sugars with heat and enzymes, which destroys all the beneficial health effects of the Agave plant. The end product is a highly refined, unhealthy syrup. It is higher in fructose than high fructose corn syrup. When your horse eats fructose-rich agave, his/her body does not release nearly as much insulin as it does when they eat regular sugar. This can affect how their body releases a hormone called leptin, which helps to control appetite. At the same time, experts believe that fructose is converted into fat more rapidly than glucose is. This can lead to several alarming consequences. The first is weight gain. The second is that agave may actually increase insulin resistance , the problems we are trying to avoid! No ingredient that is a sugar or generally understood to contain sugars. No such labeling requirements exist for Equine feeds and treats; testing is not required to obtain a label stating low or no-sugar product. We know that the sugars and starches your horse eats in the diet are very important, which is why we choose ingredients that are high in fiber, and naturally low in sugars and starches. We went far and above the label requirements to include testing for ESC (simple sugar) and starch to provide your horse with a delicious and SAFE treat!